This firm is the oldest continuously operating music publisher in the world, with a nearly 400-year history. The firm was founded in 1719 in Leipzig by Bernhard Christoph Breitkopf (1695-1777), most likely on 24 January1. However, the firm did not publish music until later. In 1725, Breitkopf brought out a Hebrew Bible as their first major publication. The first musical score was Schemellis Gesangbuch (1736). Bernhard's son, Johann Gottlob Immanuel (1719-1794), "one of the most versatile figures in the history of German publishing and printing"1 brought the firm to greater prominence. He improved typeseting of music so that music could be printed in larger and more capable editions. Works published included those by Telemann, Leopold Mozart, Haydn, C.P.E. Bach, and Carl Stamitz. By the latter half of the 1700s, all major composers at least tried to have Breitkopf publish works. The "Härtel" was added to the name when Gottfried Christoph Härtel (1763-1827) took over the company in 1795, as Johann Gottlob's sons thought that they could not handle the firm. Härtel became the sole heir of Breitkopf. It was Härtel who first considered publishing complete works editions, publishing "Oevres completes" of Mozart, Haydn, Clementi, etc. Important publications followed: Messiah in 1803, Bach's Ein Feste Burg ist Unser Gott, BWV 80 in 1827, and numerous others, among which 25 Beethoven first editions. The esteemed Allegemeine musikalische Zeitung was, in fact, founded by Härtel. In 1807 Härtel began to manufacture pianos, an endeavor which lasted until 1870. The Breitkopf pianos were highly esteemed in the 19th century by pianists like Franz Liszt and Clara Schumann. Härtel's sons Raymund and Hermann (1803-75) took over by 1835, and proved more than equal to their father in farsightedness and business acumen. Hermann was friends with Mendelssohn and Schumann (both in Leipzig) and published the first edition of Schubert's C Major Symphony, D. 944 at Schumann's behest. Breitkopf und Härtel were the first to publish the operas of Meyerbeer, Cherubini, Donizetti, Bellini, Mehul, Marschner, and Auber. However, their most famous (and some would say greatest) achievement was in publishing the Gesamtausgaben (Complete Works Editions), starting in 1850 with Bach, and continuing to this day. The Härtel Brothers also published several important musicological texts at the same time. Hermann created an Italian-style villa, the Römisches Haus in Leipzig, which was an important center for the arts from 1834. Another important phase began in the 1870s. Oskar von Hase (1846-1921) and Wilhelm Volkmann, nephews of the Härtels took over the company. It was Hase who initiated the "libraries" (Orchester-bibliothek, Kammermusik-Bibliothek, Volksausgabe, etc.). 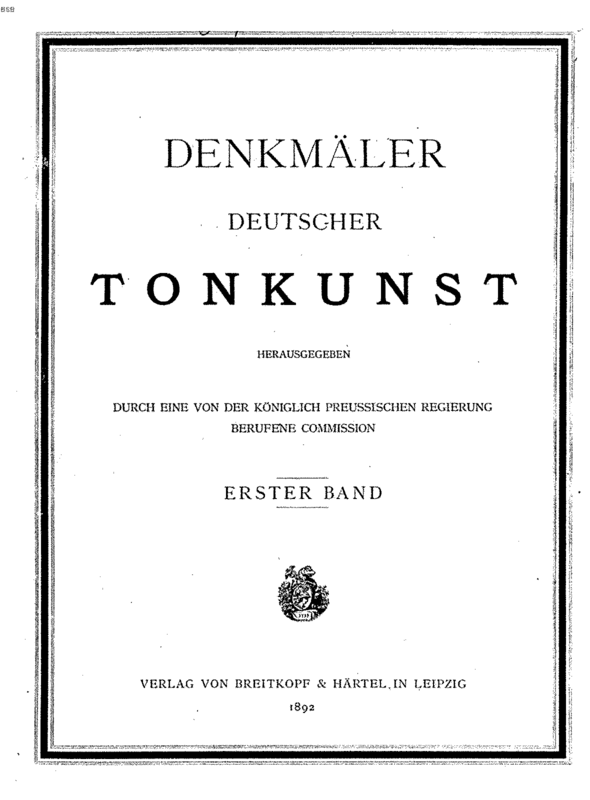 At the same time, the firm published Denkmäler deutscher Tonkunst (1892-1938), a "nationalistic," Teutonic "monument." C.G. Röder's new printing technology allowed sheet music to be cheaper, reaching a mass market, so there was intense competition among publishers of cheap editions (Volksausgabe). Succeeding Oskar von Hase, his son, the eighth of his nine children,Hellmuth von Hase (1891-1979) took over. He directed the firm from 1919, and was active in professional organisations between the wars. Following the partitioning of Germany in 1945, Hellmuth relocated his operations to Wiesbaden (near Frankfurt) in the Bundesrepublik Deutschland. In 1952 the Deutsche Demokratische Republik nationalized the remaining assets in Leipzig, and publishing continued there under the name VEB Breitkopf und Härtel. In 1991 the separate companies negotiated a reunification. The catalogue currently contains over 1000 composers, 8000 works and 15,000 music editions or books on music. The company has consistently supported contemporary composers and has had close editorial collaboration with Beethoven, Haydn, Mendelssohn, Schumann, Sibelius, Busoni, D'Albert, Liszt, Wagner and Brahms. Currently in preparation are new gesamtausgaben of Boehm, Gesualdo, Lassus, Mendelssohn, Scheidt, Sibelius and others. Issued 1850-1899, 1926. 46 volumes plus supplement (1926). Issued 1858-1894, 1902. 96 volumes plus 6 supplements. Reprint - Ridgewood, NJ: Gregg Press, 1965. HAYDN - Joseph Haydns Werke. Erste kritische durchgesehene Gesamtausgabe. Issued 1907-1933. 11 volumes (incomplete). Issued 1874-1877. 19 Series in 34 volumes. Uitgegeven door Prof. Dr. Johannes Wolf. Issued 1862-1907 in 33 Volumes, edited by Franz Xaver Haberl, a.o. Issued 1884-1897. 21 series in 33 volumes. Breitkopf seems to use its plate numbers in a chronological manner. Dates given in plain type have been confirmed in the Hofmeister Monatsbericht (or Hofmeister Monatsbericht Online), Fuld, or similar sources. Dates in italics are estimated, those with an asterisk are copyright notice dates that were probably added after the fact as a "scarecrow." The Brussels branch from some point has its own series of plates "B. ***". 02326 Hummel 6 Easy Pieces, Op.42 1812? 03439 Mozart Die Zauberflöte, K.620 (?) 1816?? Note: Dates of publication for plates 29023 and 29024 are from Dent, Edward J. (1933).Ferruccio Busoni: A Biography. London: Oxford University Press, p. 350. Plate numbers in this series are in the following format: V.A. ####. Dates in italics are estimated. 1208 Scharwenka, Philipp Pfte-Werke zu 2 Hdn. Volksausg. 3. Band. Orch.-B. 392/393. MacDowell: Piano Concerto No.2, Op.23 (orchestra parts), 1st edition, 1902. Orch.-B. 1121/22. MacDowell: Suite No.2, Op.48 "Indian" (orchestra parts), 1st edition, 1897. Orch.-B. 2319. Sibelius: Symphony No.4, Op.63 (parts), 1st edition, 1912. Orch.-B. 2493a/c. Scalero: Suite for String Quartet and String Orchestra, Op.20 (string quartet parts), 1st edition(? ), 1921. Part.-B. 261 Wagner: Ouverture, Eine Faust (full score). Part.-B. 909 P. Scharwenka: Violin Concerto, Op.95 (full score), 1895. Part.-B. 955. MacDowell: Suite No.2, Op.48 "Indian" (full score), 1st edition, 1897. Part.-B. 1663. Georg Schumann: Liebesfrühling, Op.28 (full score), 1st edition, 1901. Part.-B. 1684. Sinigaglia: Violinkonzert Op.20 (full score), 1st edition, 1903. Part.-B. 1700. Busoni: Arlecchino BV 270 (full score), 1918. Part.-B. 1784. Sibelius: Symphony No.2 (full score), 1st edition, 1903. Part.-B. 2023. Cleve: Piano Concerto No.3 (full score), 1st edition, 1907. Part.-B. 2046. Paine: Overture to Shakespeare's 'As You Like It' (full score), 1st edition, 1907. Part.-B. 2047. Paine: The Tempest (full score), 1st edition, 1907. Part.-B. 2156. MacDowell: Piano Concerto No.1, Op.15 (full score), 1st edition, 1911. Part.-B. 2319. Sibelius: Symphony No.4, Op.63 (full score), 1st edition, 1912. Part.-B. 2331. Stock: Symphony No.1, Op.18 (full score), 1st edition, 1912. Part.-B. 2457. Hubay: Symphony 1914, Op.93 (2nd sym.) (full score), 1917. Part.-B. 2516. Zilcher: Symphonie No.2 F-moll..., Op.23 (1st edition full score), ©1923. Part.-B. 2662. Kurt Thomas. Quartett in F moll, Op.5, ©1926. Part.-B. 2665. Karl Weigl. Streichquartett, Op.20, ©1926. Part.-B. 3185. Kurt Thomas. Serenade für kleines orchester, Op.10. ©1929. Part.-B. 3340. - Johann Nepomuk David: Symphony No.3, Op.20 (1941) (full - study - score), published ©1942, plate 31142. K.M. 0300-303 Bruch String Quartet No.1, Op.9 1900?